Well it’s July which means we have seen lots of World Cup action! At Soccer in Slow Motion we’ve enjoying sharing the advanced ball control skills around the US for World Cup viewing parties! And everywhere we go we’re often surprised by the skill level of players who come join us at events. Today’s youth players are showing more advanced skills, we see more players with street soccer skills. And along with the sharing of skills we also get to meet soccer celebrities! For a great video from our New York action, including playing with Ronald McDonald himself, check out the link below! We teach Ronald how to do a neck stall! Click here, or the image to see the full video clip! Along with the great time in New York and Los Angeles for viewing parties, where we saw some incredible opening round World Cup matches, we also held a street soccer event for Telemundo in San Jose, California! 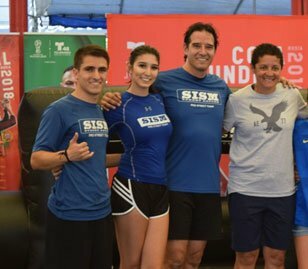 One of the highlights from this event was getting the chance to play with the Brazilian superstar, and captain of the women’s World Cup Team, Sissi! What’s also exciting is that as part of Soccer in Slow Motion I had the chance to hold the women’s World Cup trophy while on tour in 2016! It was definitely a highlight of my summer! I got to play on the court with one of the biggest names in women’s soccer history, I was like the star struck kid for a moment! One more fun fact with Sissi… In 1995 SISM owner and team member Maria did a painting of Sissi when she came from Brazil to play. 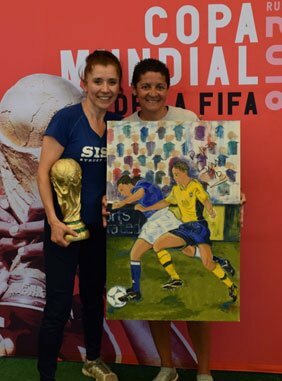 She took it to the stadium and managed to get the opportunity to get Sissi to autograph the painting. This past weekend Sissi and Maria had the chance to come together again with the painting done over 20 years ago! Expect a new painting of Sissi to come out in the near future! We head out again soon for more events where we’re going to look to highlight youth talent as we head back to New York, Miami, Atlanta, Los Angeles in the upcoming weeks! On top of our already large base of Special Kontributors, we also have Guest Kontributors. We thank all who have taken the time to kontribute to FUNdamentalSoccer.com!